Mego got a lot of mileage out of producing toys based on televion shows in the Seventies. Of all the companies that sold TV figures and Playsets during the era, none did a better job than Mego. Compare the “Welcome Back Kotter” or “Charlie’s Angels” lines from Mattell to the Happy Days or Starsky and Hutch offerings from Mego. For that matter, compare their Space 1999 line to Mego/Palitoy’s! Some of the best TV product was produced overseas. Mego, through it’s subsidiaries such as Palioy, Denis Fisher and others, secured rights and manufactured toys in overseas markets. 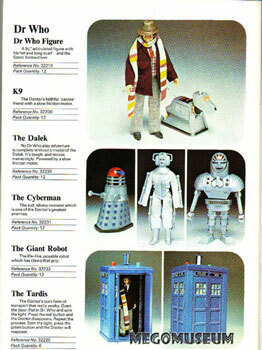 Whether for television produced in Europe (such as the immensely popular Doctor Who in Britain) or more commonly, US shows that had found an audience overseas (the puzzling Mighty Mightor) or shows for which Mego may not have had North American rights (such as Space:1999 ): Mego ruled the airwaves and the toy aisles.